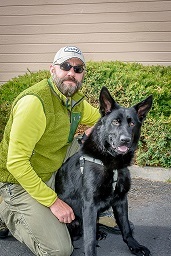 Stay turned for our upcoming Podcast Interview with dog trainer Dennis Fehling, CPDT-KA, CBATI, of Friends for Life Dog Training in Redmond, Oregon, who is passionate about giving back and helping veterans suffering from Post-Traumatic Stress Disorder (PTSD). He and his wife Pam Bigoni worked with a program called “Battle Buddies” in Oregon, training veterans and their service dogs. Dennis invited two veterans whom he worked with in the program, Tom Imholt and Dax McMillan, as well as retired Navy Seal John Surmont, to talk about the effects the dogs had on their lives. 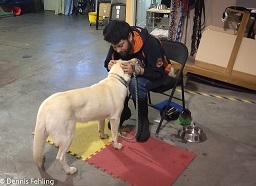 Dennis also discusses what kind of training he did with the veterans and their service dogs. I am a vet and a trainer. This is something I could help with. Thank you for your comment, Peter! 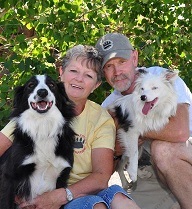 I will pass it on to Dennis Fehling of Friends for Life Dog Training. I love the work you all are doing. I don’t have a long history of training dogs, but it has always been a passion of mine. I work a full-time medical job and train dogs on the side (when i have time). I’d love to learn how to train dogs to help veterans with PTSD. That is amazing! Thank you for what you do! Thanks Kendra! 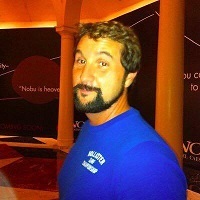 I’ll pass your comment on to Dennis Fehling of Friends for Life Dog Training.